the Rev Francis Jones, Rector of Midleton, chose Midleton Courthouse as the venue for the meeting of 6th January 1845 to discuss the building of a railway. The meeting was called in response to a petition drafted and signed in December 1844. The petition was made to Francis Jones in his capacity as the last Sovereign of Midleton. In 2015, some 340,000 passenger journeys were made on the Cork to Midleton railway service. This is an astonishing number given that the population of East Cork is nowhere near that figure. And, it should be recalled that this line only reopened in 2009, having been closed to regular passenger services since 1963. In the first six months of 2016, some 260,000 passenger journeys were already recorded on the line. When you consider that this line now has more daily services than a century ago, it shows the wisdom of reopening the local commuter lines to take the strain from the overcrowded road network around Cork. This enthusiasm for idea of building a railway began in 1844. In December of that year the Rector of Midleton published a public notice in The Cork Examiner newspaper (now the Irish Examiner). The Rector, the Rev. Mr Francis Jones, didn’t actually publish the notice in his capacity as Rector, but as the last Sovereign of Midleton – four years after the Corporation of Midleton had been abolished. However, Jones was still addressed as Sovereign (or mayor) of Midleton until his death – since there was no Corporation to vote in a replacement and the reform had failed to abolish the office! The notice that Jones published is interesting because it shows the beginning of a shift in influence. Until then Youghal had been the key town in East Cork. Cove, later Queenstown, rapidly gained prominence due to its status as a port for emigration. 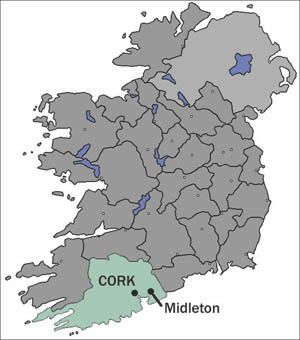 Midleton remained relatively small – but it had just built the only workhouse between Cork and Dungarvan. This workhouse would see Midleton’s population INCREASE during the Great Famine between 1845 and 1851! In that period, Youghal’s population decreased, although it was still the largest town in East Cork until well into the twentieth century. Today, Midleton is a thriving, bustling, market town and business centre, but Youghal seems, sadly, to be in the doldrums. We, the Undersigned, request you will appoint an early day for a Meeting of such Persons as feel interested in the formation of a Line of Railroad between Cork and Youghal, with a branch to Cove, in order to adopt such measures as may be calculated to place before the public correct information as to the advantages likely to result from the undertaking. This petition was addressed: To the Rev. Mr Jones, Sovereign of Midleton. In compliance with the above requisition, I hereby appoint a Meeting of ‘such persons as feel interested in the formation of a line of Railroad between Cork and Youghal, with a branch to Cove,’ to be held in the Court-house, Midleton, on Tuesday, 6th inst, at the hour of Twelve O’Clock. Among the sixtyfive names attached to the petition are the local Justices of the Peace: Thomas Stubbs JP; Robert Ware, JP; Sampson TW French, JP; William W Lambert, JP; Edward Millett, JP; R Holmes, JP; Edmond Roche, JP Kilshannick (Kilshannig, near Rathcormac); EB Roche MP, Trabolgan; GS Barry, JP, DL; Edward Odell, JP. The identifiable clergymen who signed the petition were Richard Gaggin, Rector of Clonmult, and William Keane, Parish Priest of Midleton. It seems likely that the three ‘Clerks‘ who signed were actually clergymen too: Andrew Todd, Clk; William Meade, Clk; and J Edmund Nash, Clk. Several solicitors and doctors also signed the petition: S Fleming, Solicitor; J Devitt O’Donovan, Solicitor; Thomas H Orpen, MD; DH Scott, MD; Thomas Garde, MD; SW Keane, MD; John Boston, AB and MD; Philip L Walsh, MD; Joseph Barry, MD. Midleton was itself well represented on the list. The Coppinger family was prominent: Thomas S Coppinger; ES Coppinger and William S Coppinger all signed. The Callaghans of Brodrick Street, Mathias Callaghan and his son, John Callaghan, signed together. The local distillers also saw the benefits: BJ Hackett (who’s distillery opened in 1824) and James Murphy, Junior, (who founded the present old Midleton distillery in 1825). J Hallaran who developed the great maltings at Ballinacurra was very prominent in the list. This list shows how people in east Cork realised the benefits of building a railway to link Youghal and Cove to Cork before the Great Famine. The year 1845 was an interesting one for Midleton. It opened on the Feast of Epiphany with the railway meeting scheduled by Francis Jones. Then came the completion of the largest brick chimney in Murphy’s distillery in April. That was closely followed by the Postmaster General in London agreeing to Lord Midleton’s request that the name of the Post Office and the town should be spelled ‘MIDLETON’ rather than in any other way. Finally, in October and November the potato blight struck the district very hard. The far-sighted gentlemen who signed the 1844 petition to the Sovereign of Midleton had to wait until 1859 to see the first part of their dreams realised as the line reached Midleton from Dunkettle. Youghal was reached in 1860. The Queenstown (formerly Cove, now Cobh) branch was completed in 1862.